Geoff Kemp first began keeping Koi in the early 1980’s and after a steep learning curve in those formative years went on to become one of the most prominent judges in the BKKS. Respected across the world for his undoubted knowledge and tireless enthusiasm, Geoff has now produced this new video - KOI SECRETS. Throughout the course of the programme, Geoff draws on his many years of accumulated knowledge to share with the viewer some of the tricks of the trade, learned through his experience of selecting high grade Koi directly from . This highly informative video will teach you how to better appreciate the important factors which can make one Koi better than another. Fundamentally important subjects such as SKIN QUALITY, BODY SHAPE & PATTERN POTENTIAL are covered in depth in an attempt to enable you to buy a better grade Koi for your money. Whether a relative newcomer to this absorbing hobby or a confirmed Koi nut, KOI SECRETS is a must have production for all those serious about learning more. 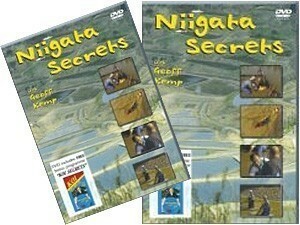 This DVD includes the free bonus program "Koi Secrets"